Morgan Freeman said, "I don't want a Black History month. Stop calling me a black man, and I will stop calling you a white man". Unamuno said that facism is cured by reading, while racism is cured by travelling. "How should we punish Hitler?" a reporter asked a young American girl towards the end of WWII. "Paint him black and bring him over here" was her bitter reply. Migrants went to the industrial cities of the North, such as Chicago, Pittsburgh and Detroit to escape from humilliation of segregation. One black migrant wrote, "I don't care where so long as I go where a man is a man". The black struggle for equal treatment became known as the Civil Rights movement. 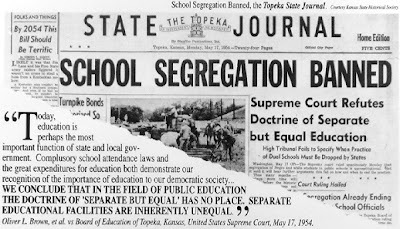 In the case Brown versus Topeka, the Supreme Court declared that segregated schools were illegal and ordered that black children should be allowed to attend any school as pupils. For full information about the case, click here and the aftermath of the case on the following link. 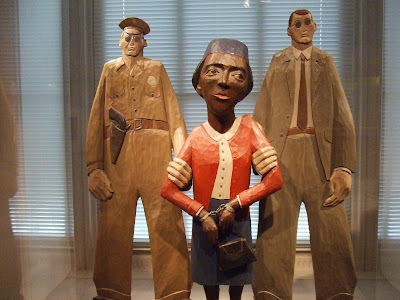 Another landmark in the black struggle came on December 1, 1955, when Rosa Parks got on the bus in her city Montgomery, Alabama. She took a seat towards the back of the bus. White workers and shoppers filled up the front section of the bus and the driver ordered her to give up her seat. As she refused to move, she was arrested. The National Association for the Advancement of Colored People (NAACP) started a campaign to end segregation on buses. MLK began to boycott the city's bus services, and from they boycott stores where black workers were refused jobs, they refused to pay rents until landlords improved housing conditions and held "sit-ins" in restaurant that would not serve black customers. A climax of the Civil Right Movement came August 28, 1963 when Martin Luther King Jr. gave his famous "I have a dream" speech. But in the 1970s and 1980s, most blacks decided that voting was a more effective way to improve their position. 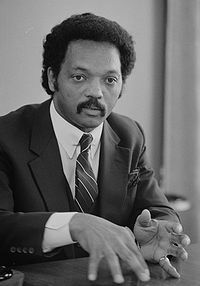 Jesse Jackson, a former assistant to MLK, became the spokeman for this idea. In 1988 he came close to being chosen as the Democratic Party's candidate iin the Presidential election of that year. On the following video there is a short history of Black History Month.